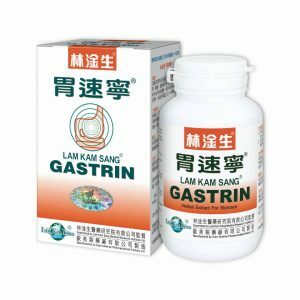 Lam Kam Sang GASTRIN effectively strengthens the immunity and resistance of the gastric and esophagus mucosa, smooths and balances the physiological function of the digestive system, and improves the self-repairing function of the gastric and esophagus mucosa to heal the basic problems which cause hidden and burning pain of the stomach, hyperacidity, scorching heat of the esophagus, loosening of the cardia, sluggish, swelling, and bloating feelings after meals and so on. Flos Rosae Rugosae, Radix Paeoniae Alba, Radix Glycyrrhizae, Radix Salviae Miltorrhizae, Radix Glehniae etc. Every tablet of Lam Kam Sang GASTRIN contains 450 mg extract of the above Chinese medicines. 2. Acid reflux causing burning pain of the esophagus, burning pain and loosening of the cardia. 1. Most of the patients will experience obvious improvement of symptom after 10-20 days of treatment. Over 90% of the patients will have complete relief of symptom after 30 days of treatment. Generally, continuation of treatment for full course is necessary for the eradication of the disease. For milder cases, 45 days of treatment is enough, but 60 days of treatment is needed for more severe cases. In serous cases, 90 days of treatment is needed and the curative rate is over 90%. 2. In some cases, some patients may have no obvious improvement after 30 days of treatment and still have upper abdominal pain accompanied with regurgitation of acid. They are likely to suffer from gastric or duodenal pain spot. 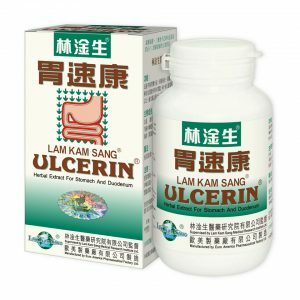 Lam Kam Sang® ULCERIN® should be considered for the problem. 3. Some patients show obvious improvement of symptom after 30 days of treatment but seem to have upper abdominal pain when hungry. They are likely to have chronic gastritic mucosa concern complicated gastric or/and duedenal pain spot. In these cases, the patient should consider taking both Lam Kam Sang® ULCERIN® and Lam Kam Sang® GASTRIN for the problems. 4. If patients show no obvious improvement of symptoms after 30 days of treatment and still have loss of appetite, change of taste and progressive weight loss, they should consult their specialist for examination for malignancy. Ms. Tang, 43 years old, Indonesian Chinese. She had been suffering from long term dyspepsia with fullness discomfort in the stomach, and swelling pain was aggravated after meals. Gastroscopy indicated superficial gastritic mucosa concern which caused symptoms of palpitation, tachypnoea, insomnia, emaciation, physical decline, spasm at the lower legs in the midnight. On her friend’s recommendation, she took Lam Kam Sang® GASTRIN for 10 days and the symptoms were obviously alleviated. She continued the treatment for another 30 days and all the symptoms greatly relieved. She felt energetic and took the treatment for a total of 60 days and no relapse is noted up to the present. Ms Cheng had been having chronic superficial gastric mucosa and gallbladder concerns and for several years. She always felt swelling pain at the upper stomach duct and the right intercostals, and could feel a little bit relieved after belching. She was really upset as she had to be very careful in choosing foods and could only eat foods in semi-liquid form, otherwise, she would have to go to the hospital for treatment. 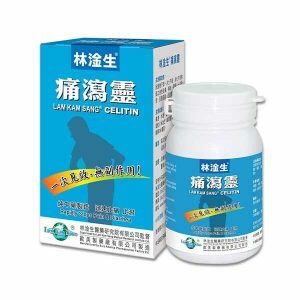 After taking Lam Kam Sang® GASTRIN for 5 days, all the symptoms were slightly alleviated. She continued the treatment for 60 days and she felt ruddy in complexion and great improvement in her appetite and digestion. Although no discomfort was noted, she took Lam Kam Sang® GASTRIN for another 20 days to consolidate the efficacy. She took a medical checkup in the hospital the next year and found that the her gastric and gallbladder were just good. Mr. Wong, 47 years old. He had been having gastric distention and fullness for 20 years. Three years ago, gastroscopy indicated gastritric mucosa concern with several pain spots. He often felt swelling pain in the stomach with prolonged indigestion and could not be cured. He was extremely fatigue mentally and his career was greatly affected. On his friend’s recommendation, he was treated with Lam Kam Sang® GASTRIN for 30 days and all the symptoms were obviously alleviated. He was so glad that he took another 30 days of treatment. No discomfort was noted, and besides vigorous and energetic, his long term insomnia was cured as well. Mr. Wong took the total course of 80 days and no relapse is found up to the present. 4 tablets each time for adult weight under 65 kg; 5-6 tablets for weight over 65kg, discretionary reduction according to weight for children, to be taken 3 times a day with warm water after meals. 1. Avoid eating deep-fried, barbecued, hot, burned and spoiled foods during treatment. Alcohol & smoking should also be abstained during treatment. 2. Avoid extravagant foods & drinks. 3. Avoid anger, depression, and excessive stress. 4. Use with caution in pregnancy. Discontinue treatment temporarily during colds, fever or acute bacterial infection.